My travel tastes tend to range from the classic bucket list items to the hipster “you went where?” items. On my first trip to Paris, I visited the major must-dos like the Eiffel Tower, Notre Dame Cathedral, the Arc de Triomphe, the Champs-Élysées, the Sacre-Coeur, and the Père Lachaise Cemetery. At that time my “off the beaten track” experience was going to see my friend perform Burlesque at La Féline Bar. Sadly, I never had the chance to write this trip as my life in 2015 became rather hectic shortly afterward. I did upload my photo albums, however, so you can still see those on the Facebook Page by following the links on each location above. For my second trip to the city of lights, I made it to the Catecombs, a couple art museums, and a bike tour of the hot spots, which I’ll be writing about later. My more obscure find was a tiny museum of Fairground Arts, the Musée de Arts Forains. It’s actually not a public museum, but the private collection of Jean Paul Favand. It includes object d’art from fairgrounds around Europe in the 19th century. The museum has done extensive restoration on the artworks, and patrons are free to ride and play many of the “exhibits” on display. It was enchanting beyond all expectations and lasted just under 2 hours. Since the collection is private, the museum doesn’t keep regular opening hours, and tours are by appointment only. I was slightly desperate to go, but the only time a tour was available during my 6 days in Paris was the afternoon of my very last day, the day I was planning to catch a bus onward to Brussels. I had no choice but to choose that day, and move my bus to a later time. I’m so glad I did. I had to check out of my Airbnb by 10am, and my host did not offer any variety of luggage storage. Neither does the museum offer any sort of cloak room or bag-check room. I checked a few websites for storage options, but it turns out that there are only a few places around town where it’s even possible and they are mightily expensive. I was travelling light (backpack only, yes, that is my actual luggage for the whole 7 week trip), but it was still at least 10-12 kilos, which can become tiresome to carry for many hours. My tour was at 2pm, and I didn’t want to walk around Paris with all my luggage, so I headed straight to Bercy where both the museum and the bus would be found. I zeroed in on Starbucks for a clean bathroom, an iced latte, and a place to sit while waiting. This long haul travel is giving me some new appreciation for the use of American stand-bys. I’ve become addicted to iced lattes in hot weather, and the French seem to think that ice in coffee is anethema. Even McDonald’s McCafe failed at providing iced coffee options, but Starbucks is the same world wide with a few exceptions for seasonal specials. I love French coffee, and I could have sat at a cafe the whole time I was waiting. No one kicks you out of a restaurant in Paris. Oddly Starbucks was a cheaper option since a coffee here is a tiny shot of espresso for 2€ or maybe a small cafe creme for 3.5-4€. At Starbucks, I got a Venti iced latte for 4.65€. I don’t want to be the tourist who goes abroad and only visits American chain stores, but sometimes, especially on a long trip, it’s nice to have the choice. Free clean bathrooms, cheaper large (iced) coffee, air-con, and free wifi do make it an ideal place to kill time if you have to. The museum was easy to find, although it looked a little foreboding from the outside. The grounds are covered in fences and the buildings all have shuttered windows. The tour guides only speak French, but they were kind enough to make an English language pamphlet that contained the pertinent information about each area of the museum we would visit. I read through it while waiting for the group to assemble, hoping that it might help me follow along. When we finally assembled and began the tour, my feelings were primarily childlike glee. My joy wasn’t the only childlike feeling I had. Standing in the courtyard listening to the guide talk in French I had a sudden flash of understanding of how every kid must feel when tour guides talk and there’s nothing to look at or do. I tried to listen, but he talked so fast I couldn’t catch much. Fortunately, as he pointed out to us, it’s really a visual tour. The courtyard was pretty and I enjoyed the gargoyles and decorations amid the trees and flowers, but I was impatient to get inside. This is the story he was telling while we were standing outside. I found the English version later. According to legend, Kind Louis XIV came to Bercy to attend mass at a nearby cathedral. Of course, all of his subjects were expected to kneel before their king during his royal visit, but when the time came for this obeisance, one man remained standing. When the guard were sent to investigate, it turned out the man was kneeling after all, but he was a giant who loomed above the crowd even in genuflection. The giant was a vintner named Martin, who used this unique chance to meet the king to talk about the taxes on wine merchants in Paris. Charmed by the giant and amused by his complaints, the capricious king decided to grant the Pavilions of Bercy a tax exemption. The 106 acre region became closed off behind walls and ware houses with railroad tracks leading to the Seine where wine shipments could be transferred by boat. The buildings that now house the Musée d’Arts Forains were at one point warehouses and market buildings. It wasn’t all wholesale business, however, and Bercy was also known for it’s wine bars and guiguettes where patrons could sip by the glass or by the bottle in convivial company. Such an atmosphere prompted festivals, fireworks and other fun, giving Bercy it’s reputation as a joyful place. As soon as we stepped inside I realized the photos I found online do not come close to representing the atmosphere of this place. Beautiful pieces of art displayed around a centerpiece of a merry go round from a classic Venetian style carnival. 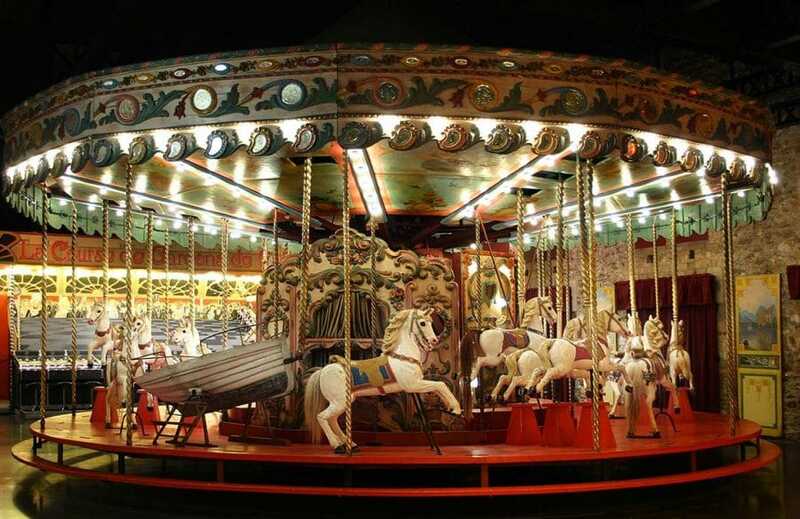 There was no roof, as a modern carousel might have, and most of the seats were elaborate gondolas and carriages with a few ornate animals with saddles. Our guide invited us to hop in for a ride and we whirled around to a recording of the original music. After the ride, we stayed seated but turned to face a wall which was decorated as the Grand Canal. The lights dimmed and we were treated to a beautiful light show that had clearly been made just to fit the size and shape of the room. We went from outer space, to under water, to a cityscape, a gondola ride on the river, a ballroom and a theater as the lights and sounds created this beautiful illusion. 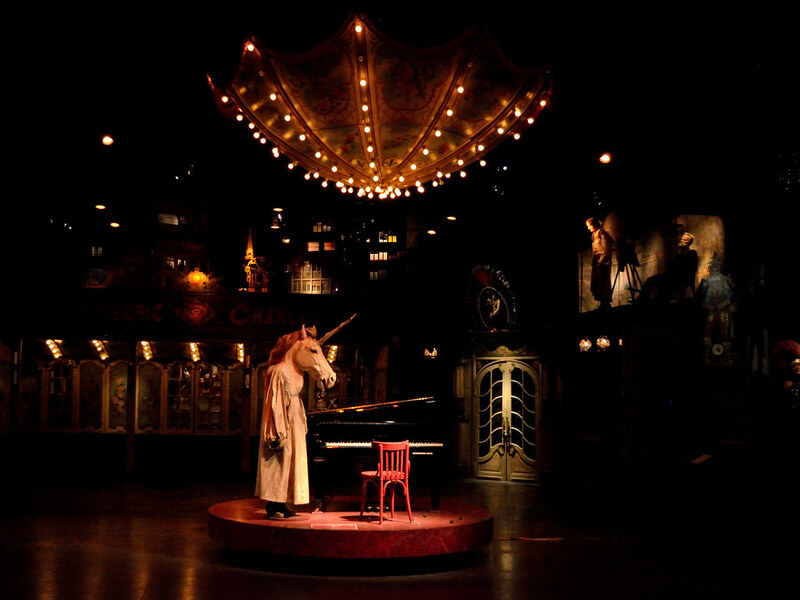 The adjacent room was an animatronic opera with singers mounted around the room on the walls just below the ceiling. The lights and speakers moved as different characters (including Columbine, Harlequin, and Cassanova) sang and the robots moved. It was like Disneyland’s tiki room or hall of presidents. It was easy for me to wander away from the group or start behind as they moved on and get photos of the rooms with no people. Since I couldn’t really understand, I didn’t feel like I was missing out. Sadly, the rooms were so dark that most of my photos are only any good for jogging my memory of the experience. 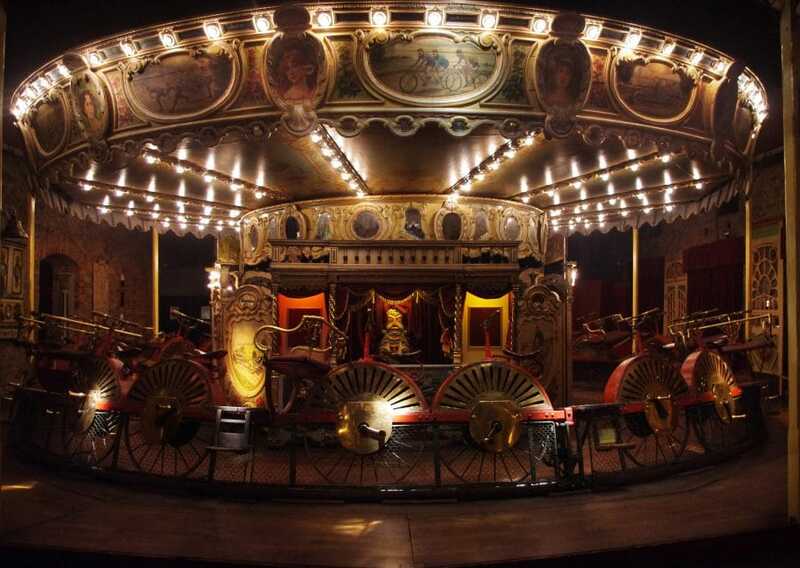 In the 19th century, the Fairground was quite popular, and the Carousel-Salon was a style of fairground that included the pipe organ, the carousel, a ballroom for dancing, and of course, a bar. Our guide cranked up the pipe organ, which was stunningly loud, and I took the time to get a closer look at some of the statues and carvings around the room. The detail of craftsmanship in these pieces was impressive. It was clear that the fair or carnival was much more than it is today. When I think of the clunky state-fairs of my childhood covered in bare bulb blinking lights and cheaply airbrushed panels on easily disassembled rides and booths, I can see how much we’ve lost in the last century of fairgrounds. Once the pipe organ ended it’s song, we were invited to ride again. This time, a more familiar carousel with the faux tent roof and a few horses that trotted up and down as the ride goes around. My only complaint is the the tours allow more people than there are seats. The guide ran the ride twice but I didn’t get to ride a moving horse either time. Despite this small disappointment, I had tremendous fun riding the antique carousel inside a room filled with similarly antique carnival rides, games, and decorations. We rode a pedal powered carousel as well. It was made up of a circle of large brass bicycles. This carousel was all about the thrill of speed. When the device was in use, warnings had to be issued that if a patron should lose their footing, they should not try to catch the pedals. Apparently the speed and force of the pedals resulted in more than one lost foot. The cycle carousel was capable of reaching 40mph (65kph) which in 1861 was dizzyingly fast! Once upon a time it also ran on electricity or steam, but the museum’s ride was purely pedal-powered. Don’t think that makes it less impressive. With every seat filled, the cycles seem more like a roller coaster ride than a carousel. There were many other oddities, pieces from other rides, and classic fairground games to look at as well. German swing boats, card tables, shooting galleries, and exotic animals lined the walls around us. Electric lights and moving pictures will still a novelty often found only at such public shows. One of the most famous shooting games is the French Waiters. I’ve seen similar racing games in most modern carnivals and fairgrounds. Shooting at your target advances your waiter and the first one to the finish is the winner. Next we entered a room full of oddities and treasures. It was Jean Favand’s own Cabinet of Curiosities including oddities such as a tree that could grow a leg and a dwarf in a boot. The center piece was made to look like the balloon of Baron Munchausen made by the collector himself. Esmerelda, the patroness of the funfair is depicted dancing. There was a huge papier-mâché elephant with a glamorously dressed rider, and Unicorn Cave is made from petrified wood, preserved plants, and mythical creatures. Our guide showed us a game called Palio di Sienna that was played by spinning a top through arches to hit a bell,and we all got to participate in a racing game that seemed like a combination of skee-ball and the shooting racer. Instead of hitting a target, you roll a ball into numbered holes for points, and your racehorse advances a little or a lot depending on how many points you got. The group played four times and I sat only one. It was very popular! We ended the tour with a waltz in a music room. A self playing orchestra like the ones I would later see in Utrecht played a waltz comprised of 12 different musical instruments. Members of the tour group paired off and danced joyously around the dance floor while waxwork oddities looked on. Great historical figures like Victor Hugo and Thomas Edison stared down, dressed in disguise, and an unimaginably queer unicornitaur (like a minotaur, but the head of a unicorn?) stood by a grand piano ready to deliver a song that would never play. The fall in Korea has been keeping me busy. I volunteered to teach a debate club this semester and I’ve been trying to get out to a few more local social groups, maybe join a book club or two. We’ve also had a lot of school holidays. Last year, the three main fall holidays came together for one glorious 10 day vacation, but this year they’re spread out across three weeks. Counter-intuitively, this has actually made more work for me, and given me less time at my desk to work on this blog. I would also like to shout out to the beautiful photogs who donate to Creative Commons because they saved my bacon from my tragically dark-derpy camera, and provided beautiful royalty free images for me to share. As always, thanks for reading, and I hope you enjoyed this hidden gem of Paris.